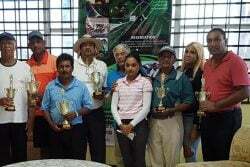 Demerara Under-19 Coach Clive Grimmond yesterday hailed the performances of his players who will defend their title against the U17 Select in the final of the Guyana Cricket Board (GCB)/Hand-in-hand 50 over tournament. Following yesterday’s washed out third round, Demerara, who lead the points table with 13.04 points, will battle the U17 youths on 11.03 points after the preliminary rounds ended yesterday. According to a press release from the Guyana Cricket Board, the third round and the final of the GCB/HIH U-19 50-Overs Inter-County 2016 Competition has been rescheduled until further notice because of the inclement weather. Speaking with Grimmond yesterday after the match was called off without a ball being bowled, the Guyana Jaguars Academy coach told Stabroek Sport that he knew his team had what it took to reach the finals. The Bourda ground was under water yet again this week. He made mention of his top players, Ronald Alimohamed, record century making openers Raymond Perez and Ronaldo Renee, all-rounder Sherfane Rutherford and others who he credited for working with their less-experienced teammates in order to reach this far. On the other hand, the U17 Select players have been a revelation this year with most persons, including Grimmond, dubbing them the best U17 team to date with the likes of Ashmead Nedd, Bhaskar Yadram, Joshua Persaud, Alphius Bookie and other who graduated from the successful National U15 side. Familiar with most of these players, some of which belong to his club, Grimmond expects a keen battle between the two sides and noted that he was preparing for the U17’s to bring their A game come the final. “I said this before, this is one of the best U17 team’s to play in a competition. Some of them came from my club and they’re playing well. who managed to knock over their opponent inside 40 overs. 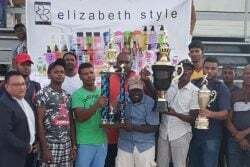 The two spots were given to the respective finalist after each side including the Berbicians and the Essequibians won a game each in the opening rounds, with Demerara and U17 securing the lion’s share of the points.